Hearing, touch, taste, sight, smell, intuition: the six senses. Technically there are only five senses, so where does intuition come in? You’ve probably heard of the “sixth sense.” Some people have superior intuition or instinct; a keen natural power. For humans, this may come in the form of knowing when a sibling is going to call, or maybe they can consistently predict when it’s going to thunderstorm. A trophy buck doesn’t magically become robust overnight; it requires a level of intelligence. They know where to bed, when to relocate, and when things are just a little “off.” In other words, they too develop a sixth sense. Fortunately for the avid hunter, there’s a fleeting window during which a buck lets his guard down. This beautiful time is known as the whitetail rut. It doesn’t mean that the big boys will come flocking to your feet, but it is a time when, if you know your stuff, you can take advantage of the rhythms of nature. The most successful hunters will work to understand whitetail deer behavior during rut. Though most people think that “rut” refers to solely to the peak of whitetail breeding season, it actually refers to all deer behaviors during rut. What triggers the beginning of the rut? In all of nature, photoperiod is a term that references the 24-hour period in which animals and plants are exposed to light and darkness. There is a direct correlation between the photoperiod and an organism’s growth, development, and seasonal patterns and behaviors. A decreasing ratio of daylight to darkness is what initiates these responses in organisms. 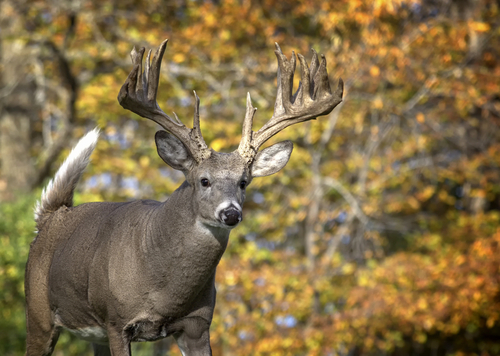 Specifically in whitetails, photoperiod is associated with antler growth and breeding season. The first sign is the mineralization of antlers and the shedding of their velvet. Following that, bucks will spar, scrape, and rub trees in attempt to establish breeding grounds and rights, all of which lead into rut. Again, decreasing daylight hours and increasing testosterone levels are correlated with the commencement of rut. Sparring, typically the first sign of breeding, normally occurs between two evenly-sized bucks or between a dominant and subordinate buck. As you can probably guess, these short-lived, push and shove matches determine hierarchy among males. As breeding season becomes closer, full-out antler battles will occur between males of similar dominance status. Rubbing and making scrapes on trees, two other rut-associated behaviors, play to the visual and olfactory senses. This action involves the buck chafing his antlers and forehead on a tree in order to leave a scent deposit. Once this initial rub is made, it’s likely that the same location will be used by several other deer. This rubbing behavior continues throughout the rut period, but it first coincides with the velvet drying and shedding. Once rubbing starts to occur, bucks begin making scrapes shortly after. Scraping continues until the apex of breeding season and then starts to decline in frequency. This action consists of a buck pawing a certain spot on the ground and then rubbing and urinating on that spot. The scrapes are normally associated with a low-hanging branch that is broken by the deer and marked by the buck depositing its scent from the mouth, forehead, or preorbital gland. It’s common for all rubbing and scraping to take place during the night. Most bucks who meet their demise during the rut season because they momentarily let down their guard to seek out their perfect mate. The scent of an estrous doe lures a trophy buck away from his cautious stance to chase after her. On the other hand, a super buck may be more reserved and hang back from this “chasing.” After all, a big buck doesn’t just magically grow into a wise deer; it takes many years for that to occur. Since deer have the ability to learn, they tend to get more intelligent with age. Despite the occurrence of rut, it’s still a challenge to spot a nice-sized buck, so don’t lose focus. You never know when your next trophy will let his guard down in your vicinity.